Tye McGinn skated in 51 games in the NHL last season, splitting time between the San Jose Sharks and Arizona Coyotes, posting two goals and seven points. TAMPA BAY — The Tampa Bay Lightning have signed forward Tye McGinn to a one-year, two-way contract, vice president and general manager Steve Yzerman announced Tuesday. McGinn, 24, skated in 51 games in the NHL last season, splitting time between the San Jose Sharks and Arizona Coyotes, posting two goals and seven points. 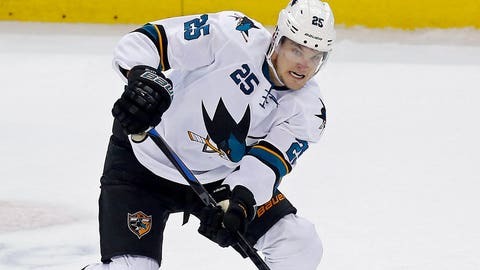 The Fergus, Ontario native began the 2014-15 season with the Sharks, appearing in 33 games and recorded a goal and five points. After being traded to the Coyotes, McGinn recorded one goal and two points in 18 games. The 6-foot-2, 205-pound forward has played in 87 career NHL games over three seasons, recording nine goals and 17 points to go along with 44 penalty minutes. McGinn played his first two NHL seasons with the Philadelphia Flyers and set career highs for goals with four during the 2013-14 season. He made his NHL debut against the New Jersey Devils on January 22, 2013. McGinn has also skated in 163 career American Hockey League games over three seasons, collecting 46 goals and 79 points. He set career highs for goals (20), assists (15) and points (35) during the 2013-14 season while skating with the Adirondack Phantoms. McGinn was originally drafted by the Flyers in the fourth round, 119th overall, at the 2010 NHL Draft.